A handful of people barricaded themselves in the Humanities 2 Building for several hours last night. 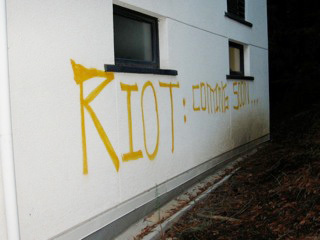 This followed a party in the Social Sciences/Humanities courtyard, which elicited numerous noise complaints from students in nearby College residences. Staff observed a trash dumpster and large landscape rocks being moved to the middle of Hagar Drive, impeding buses and other traffic. Three people carrying a large table near the entrance to the Humanities Building - apparently intending to vandalize or blockade the building - cursed at an officer and defied multiple requests to stop. Pepper spray was used to subdue them. One of the three was arrested; the others fled on foot. Campus cleanup crews this morning began removing graffiti from Humanities 2, an adjacent restroom, Bay Tree Bookstore, and Cowell and Stevenson Colleges. 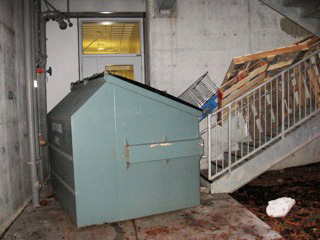 Staff were also working to clear dumpsters and broken picnic tables from exterior stairwells in Humanities 2. When added to cleanup costs following the earlier occupation of the Graduate Student Commons, these efforts will run into tens of thousands of dollars - costs directly borne by taxpayers, students and their families. Those dollars are diverted from educating and supporting students. The two "occupations" of campus buildings since the beginning of fall quarter appear to be related to dissatisfaction with UC funding and related budget issues. It seems incongruous, if not absurd, that people declaring UC to be "their university" would deface campus buildings and deny access to spaces used by and for students, faculty, staff and campus guests.